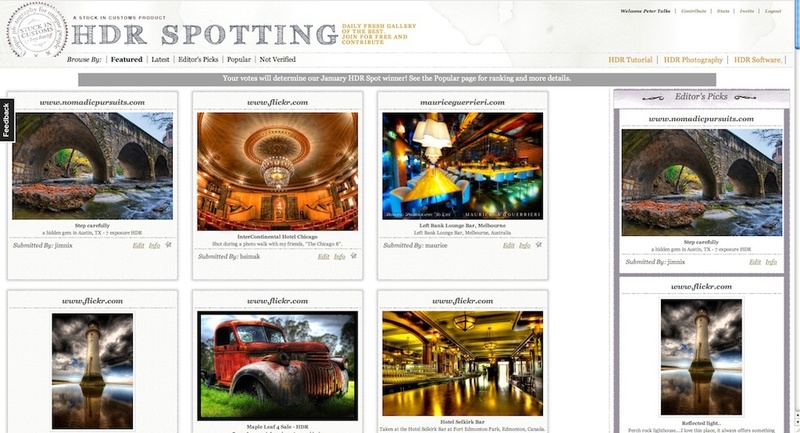 I am very excited that my photo from my blog post last Friday (Jan 8) was chosen as the Editor's Pick at HDRSpotting. If you haven't been to this website, it is a great collection of HDR images that are produced and shared by folks all over the world. I have submitted many photos there, and this was my first Editor's Pick - very exciting for me! It has also received the most views of any of my photos there yet! The funny thing was that I was in a hurry to head out of town with a buddy and, though the photo was finished a few days earlier, I chose it on a whim and hastily posted it so I could get out of town. It wasn't until later that evening I checked my email and had a note from my friend Pete Talke, who runs Places2Explore, telling me that it was Editor's Pick. So I asked Pete if he could get me a screen shot of it, since I was on the road and didn't have good online access. He did, and that is the image you see above. Funny thing is that you can see his name in the upper right corner, since he was logged into the site and got it for me. Thanks Pete!